Marty Fischer was my friend for more than 20 years. He died of a heart attack Monday night at age 61. He was the big brother I never had. I did have a big sister, who was a lesbian and quite the dike to boot, but Doreen, gone now 11 years from drug abuse and taking herself too seriously, really didn't fit the brother role as well as Marty did. I could count on Marty. I could count on Marty to council me and to comfort me and yes, to let me know when I disappointed him. He was a sensitive soul. He was sweet coupled with an irritating way that each day was a new day to prove my allegiance and love to him. That part sucked. But, that part was only a small part of Marty. Marty lived to make people happy. He'd be the first person to party more after the party ended. His recent hangout was the downtown restaurant La Mela, but Brooklyn born Marty was Mr. Diner. Oh, and Mr. Chinese buffet. This is where "Marty's Party" began. Years ago a Chinese maitre d directed Jimmy and me to a backroom gathering that Marty was hosting, "You here for Marty's Party?" Since then I called him this and began all my e-mails to him, "Hi Marty's Party,"
No one could pile a plate higher and dig in deeper than Marty. And, the check always mysteriously disappeared, paid by, you guessed it, Marty. The man loved to eat because he loved to live. For him, it was all about excess. Maybe, it was his play for broke habits that killed him. Or, maybe, acutely aware that his father died in his early sixties of heart disease, Marty was racing the clock. He struggled to get it all in. He did it his way. He played Blackjack just enough that it hurt to lose. He invested in edgy businesses he had a passion for, mainly comedy clubs. This is where Marty shined. He immersed himself in comedy management. He drank in the comedy scene and comics loved and respected him. And, not for nothing, he was funnier than most. He beamed when a comedian came off the stage, went right to his table and thanked him for the opportunity. He beamed even larger when big name comics were introduced to him and they shook his hand and said, "Of course, I know Marty Fischer!" 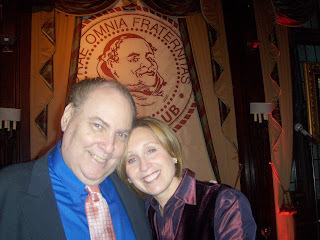 Ten years ago Marty sponsored me for Friars Club. I'd watch him schmooze with the staff, the members, the waiters. He had a special relationship with the waiters because "They give me stuff that's not on the menu." As generous as Marty was, he had an area that prevented him from spending. We all have it, I guess. Jimmy could spend a fortune on a horse, but buying paper cups was "wasteful." With Marty if he got something for nothing it was not only a coo, but it must be used. His business card printer misspelled his name, Martin FISHER - left out the c. He let Marty have them for free. Marty gave them out and then bitched that people misspelled his name. A man about town, he loved most being with his grandsons, Alex, 5 and a half and Evan 2 and a half. And they worshipped him. The other grandpa is also named Marty, so the boys called him "Grandpa Marty Who Lives Alone." But, he was never really alone. Marty was a fixture in so many lives and it's almost impossible to believe he's gone. Little by little, if we live long enough, the people we love disappear. We can't call them on the phone or touch them, but we can remember them. I know this isn't an original thought. It's universal. It's human. In a few weeks Marty's friends, comics and family will gather to have a Comedy Tribute to him, a parade of loved ones to celebrate his life. We will attempt to give him the last Marty's Party.